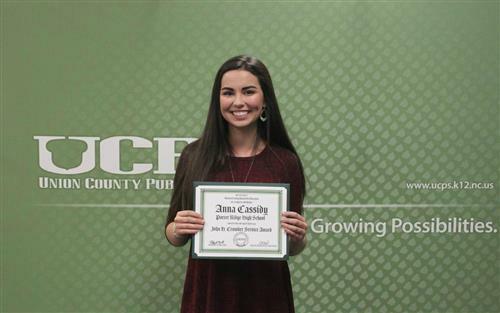 Porter Ridge High is pleased to announce that senior Anna Cassidy is the April 2019 recipient of the John H. Crowder Service Award. This distinguished award goes out to high school students who are making positive differences in the school. The service award is in honor of late John H. Crowder who served on the Union County Board of Education for many years. Students eligible must be academically successful and must have a history of community service with more than one organization. 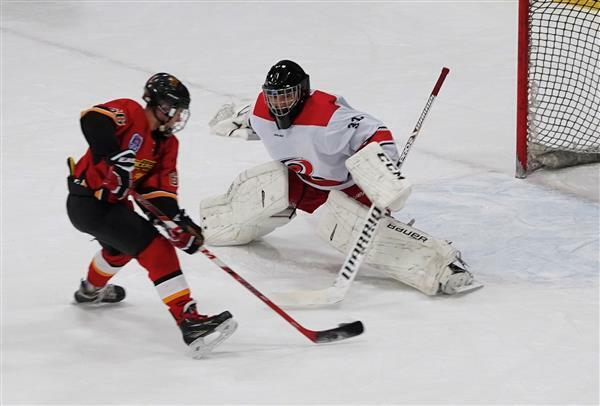 PRHS student and his team qualify for USA Hockey Nationals! Joshua Burns is currently a junior at Porter Ridge High and from the young age of 7 has played ice hockey as a goalie. After watching the movie Miracle he was determined to make it to the Olympics for ice hockey. Although he’s not to the Olympics yet, he has been sacrificing his weekends and weekday evenings to get closer to his goal and will be competing with his team in the USA Hockey National Championship! Porter Ridge High School offers many fun and rewarding academic programs, among these is the Career and Technical Education (CTE) Pharmacy Technician Academy. In this program students explore the world of pharmacy, including related jobs; roles in a pharmacy; different types of medications, including what they are used for and how they react with different variables and the science of medication. 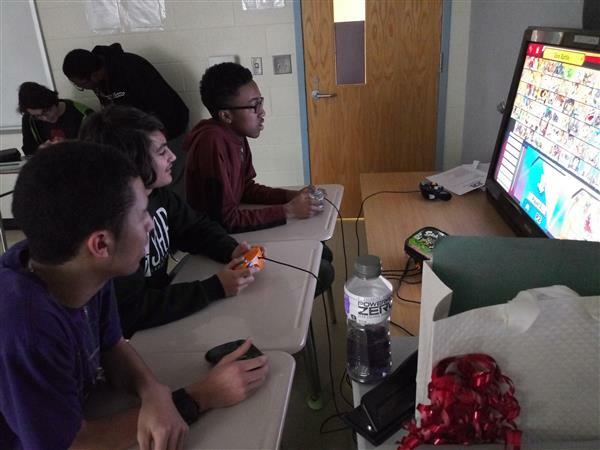 The Gaming Club here at Porter Ridge High School is a place where students who are interested in video games go to discuss and play after school. Anyone who loves to play and be around others of the same interest is welcome to join! Female gamers are welcome too! The PRHS Robotic Club is a club for students who are interested in learning and have the desire to build robots throughout the year. The club has teams that compete in competitions twice a year, once in the fall and once in the spring. Time to prepare for exams! As the first semester at Porter Ridge High School comes to a close, students and teachers are preparing for the exams that will take place the week of Jan. 14th through 18th. The Friday before Jan. 14th, students will have a review period during 1st block and 1st block Pirate Prep to prepare for the first exam on Monday. 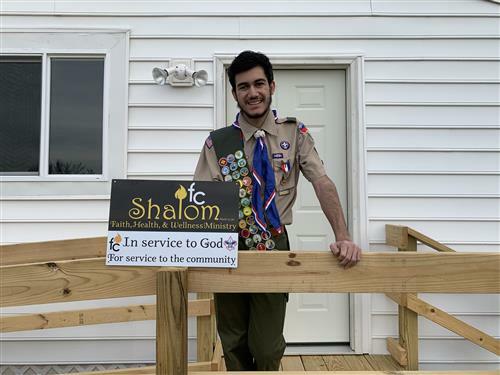 This holiday season, Porter Ridge’s clubs and organizations came together to give back to those in need. Several clubs here at PR hosted donation events to spread joy throughout the community. Through all of the generous donations, joy and holiday spirit has been spread throughout the community and to those who need it most. 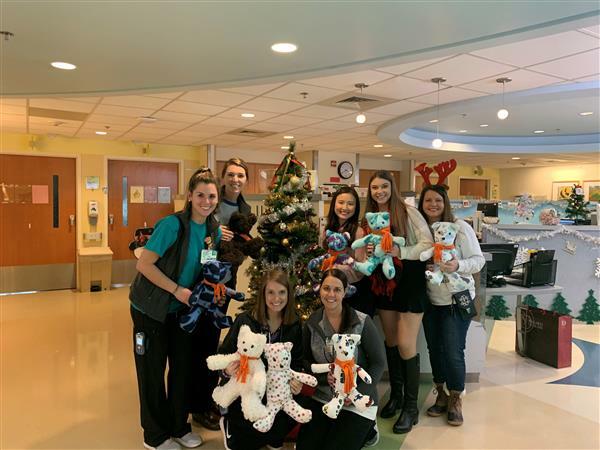 This past weekend, senior Sierra Langston from PRHS and foreign exchange student Soomin Lee took 52 teddy bears that they had personally sewn and stuffed to kids in the Levine Children’s Hospital. Langston put this event, called Teddy Bears for a Cure, together for the opportunity to bring some joy to children in some unfortunate situations. The Porter Ridge Chapter of the National Honor Society sponsored a pet food drive for the Humane Society of Union County from Nov. 28th through Dec. 12th. This was one of the most successful community projects ever for the club. 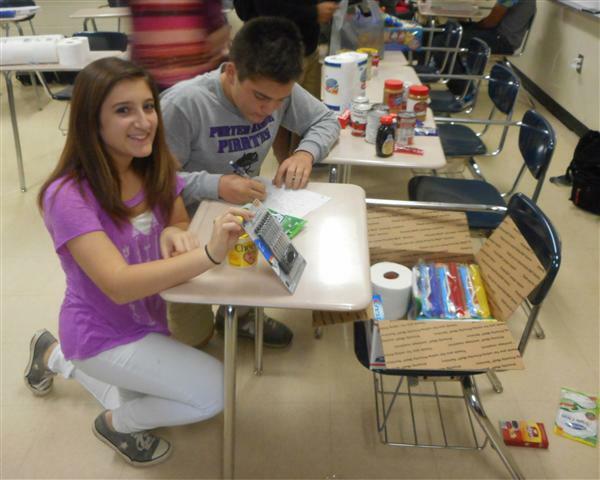 Porter Ridge students’ and their families’ generosity during this pet food drive was exceptional. Members collected almost 1200 units ranging from 2 oz. cans to 55 lb. bags of cat and dog food. The 2018-2019 Castaways have made a big statement this year. From performing at North Carolina Theatre Conference to Theatre I students performing their first showcase, the PR Theatre Dept. has offered multiple shows with a variety of points of view. 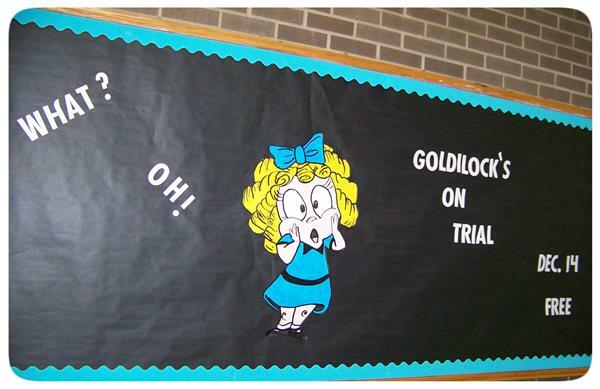 Most recently, the Theatre II Castaways performed The Trial of Goldilocks on Friday, Dec. 14th. Three years ago, Porter Ridge Middle seventh grader Caroline Kramb went to the doctor after coming into contact with poison ivy. However, she quickly learned that what she thought was normal bruising from scratching at her poison ivy rash was actually one of the telltale signs of Idiopathic Thrombocytopenia Purpura (ITP), a rare autoimmune blood disorder that affects less than 200,000 people in the U.S. The Air Force Junior ROTC instructors and cadets of Porter Ridge and Piedmont High Schools in Monroe, NC earned an overall Unit Evaluation score of “Exceeds Standards,"the highest rating attainable, during their evaluation on 7 Nov 2018. The cadets jointly briefed the Air Force evaluator, conducted a Pass in Review and drill routine, and completed an extensive assessment checklist. PR's Men's Soccer SW 4A Champs Again! 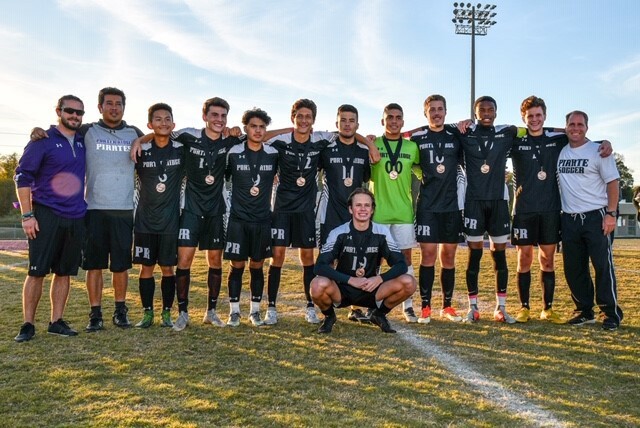 PR’s Men's Soccer team finished their regular season off on a high note, beating Hickory Ridge in a 7-0 shutout on their senior night and winning the Southwestern 4A Conference! The Pirates ended their regular season with an exceptional record of 21-2. 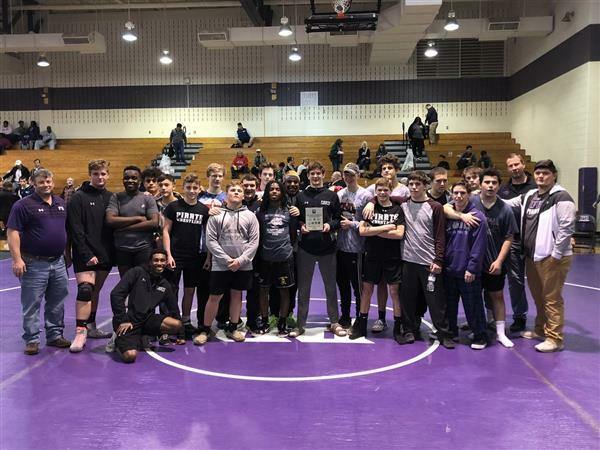 This is the third year in a row the team has won the conference championship! At the end of the 2017-18 school year, the Band of Pirates received shocking news: their beloved band directors, Ian Faires and Phillip Loftis, had accepted jobs elsewhere. Emmanuel Ross and Ashleigh Cook were hired in their place, bringing with them new ideas and techniques for both practice and performance. At first, the band struggled to adjust. They found it hard to erase memories of old commands, and even harder to replace them with new ones. However, as they got used to their new directors, they began to improve daily. The Porter Ridge Creative Writing Club is up and running again as another school year begins. 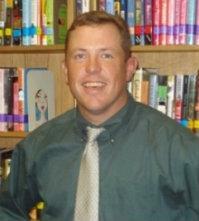 The club’s sponsor and mentor is English teacher Richard Boyles. The club President is Kylie Atkins and the Media Director is Jamie Marano. They meet after school every other Friday in room G112. The club is open to anyone who wishes to join. From September 15th to October 15th Hispanic Heritage Month is recognized and honored, and Señora Grello’s Spanish II classes celebrated! Throughout the month her students enjoyed talking about Hispanic culture. Nearly every single day, different students shared either food or activities with the class. There were new foods to try and new games to learn! 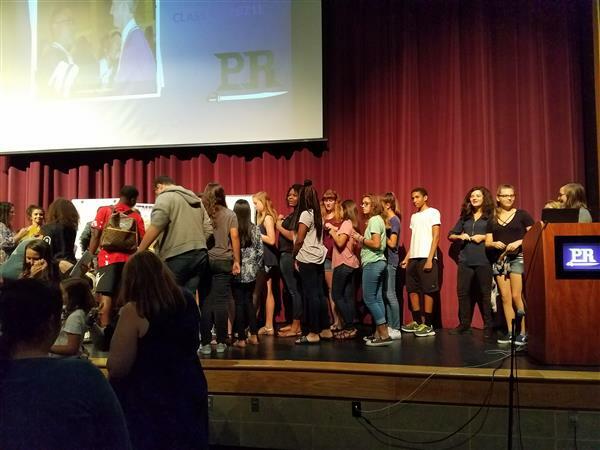 PR held its annual Club Fair Sept.13th, 20th and 21st during all lunches. There were a total of 25 clubs that were represented by displays in PR’s commons area. During these lunches student were able to come up and look at the variety of clubs on display and if interested, they were able to sign up on the sheet provided by the club. As college application season kicks into high gear, Union County Public Schools (UCPS) is providing a new and free resource to help middle and high school families with applications,course planning and information about college board assessments.The UCPS College Readiness Resource Center will open Oct 1, just in time for the start of the Free Application for Federal Student Aid (FAFSA) application period. Get ready for Homecoming 2018! Homecoming week is approaching! It's one of the most popular times of the year! So many events are happening. The week begins October 9th and ends on the 13th with the annual Homecoming Dance! It is time to mark calendars and prepare for a fun week! Each day has a theme for dressing up. Tuesday is Twin Day, Wednesday is Class Wars-each class will dress in their assigned color, Thursday is Super Hero vs. Villain Day and Friday is Alter Ego Day. 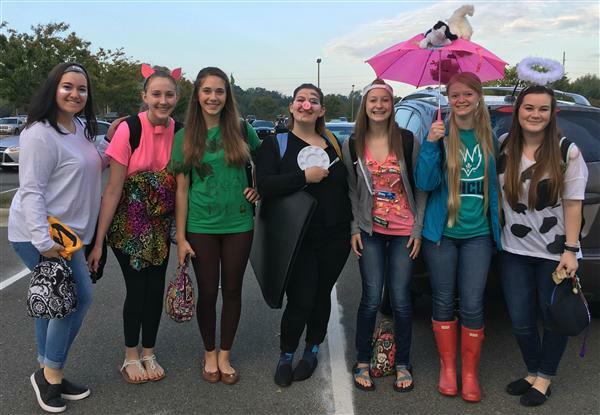 Students are encouraged to dress up each day and will be photographed for the PRHS website and social media. For 21 years, Richard Webb has worked as a technician in the auto industry. It’s a job that he enjoyed and was passionate about for more than two decades. 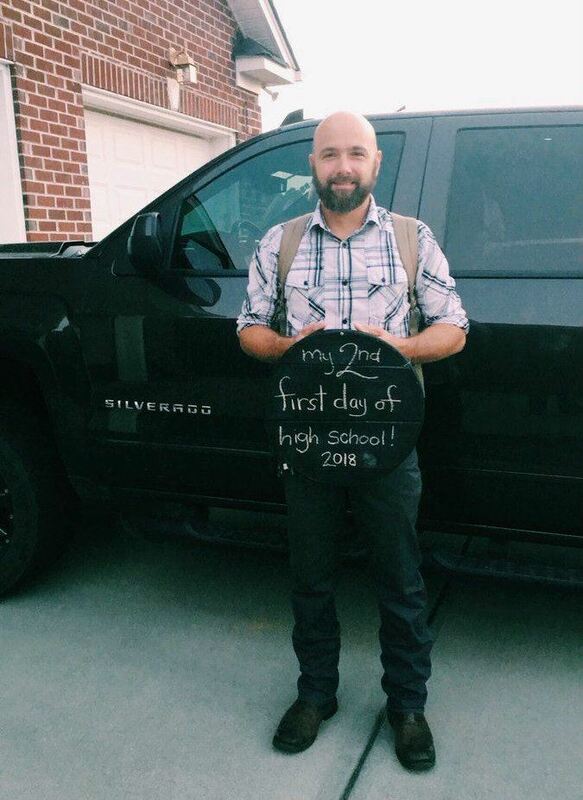 But after listening to his friends who recently left the industry talk about their rewarding careers as teachers at Forest Hills High, South Providence and Central Academy of Technology and Arts, Richard finally made the decision to trade his automotive shop for a Porter Ridge High classroom this school year. The 2018-2019 school year is off and running with Porter Ridge High opening doors to over 1700 students on August 27th. This year like many others brings changes and new ways to help students as they journey through high school. Among the new items this year are Pirate Press, Pirate Advisory and increased student use of Naviance. The Band of Pirates started their Annual Band Camp this year with a Leadership Activity for their Band Leaders. The following day the Band Directors and Band Student Leadership were out in force welcoming incoming ninth grade musicians! Porter Ridge High School’s Dr. Anne Radke attended the American Wilderness Leadership School (AWLS) in Jackson, Wyoming July 20-27. The AWLS program offers hands-on lessons focused around the North American Model of Wildlife Conservation as well as engaging take home lessons on conservation education that have been integrated into K-12 math, science, language arts, social studies and physical education. The Swahili word, Umoja stands for unity. At Porter Ridge High School the Umoja Club has grown over the years. The club’s sponsor and mentors are: Earlene Hoff, Charles Gavins, Angel Washington, and Antonio Bundick. Umoja’s mission is to teach students responsibility, respect, commitment, leadership, and how to graciously give back to the community. PR blood drives set record this year! On a day to day basis people rarely think about the need for donated blood. Natural disasters, severe weather situations and declines in donations often cause nationwide blood shortages. That's why the Porter Ridge High School Interact Club teams up each fall and spring with the Red Cross to hold blood drives at school. “Donating blood is a vital chance to directly save lives. 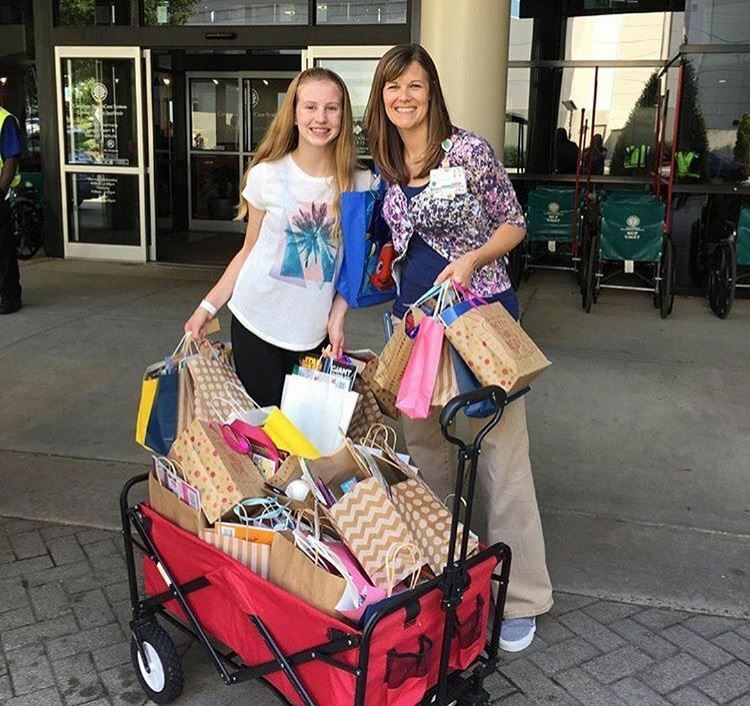 It's such an important part of our hospitals and healthcare systems that we can easily contribute to,” Interact Club Sponsor Becky Craig commented. On Wednesday, April 18th Porter Ridge High School hosted the third annual Earth Day Fair. The Media Center partnered with Jill Adams’ third period Earth Science class to set up and run the fair. Students spent the week before meeting in the Media Center where Media Coordinator, Regina Snelson, instructed them on creating effective display boards and interactive games for the fair. 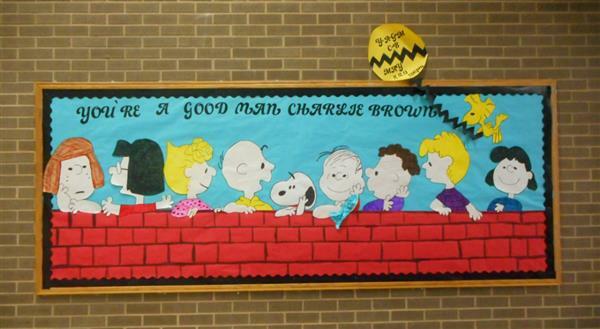 The Musical Theatre Class at Porter Ridge High School will be presenting the 1967 musical comedy You’re a Good Man, Charlie Brown on May 10th, 11th, and 12th at 7 p.m. The show stars Charlie Brown and his friends as he goes on a journey to discover if he really is a good man like his friends say. PR’s Future Farmers of America (FFA) club has been busy this year. 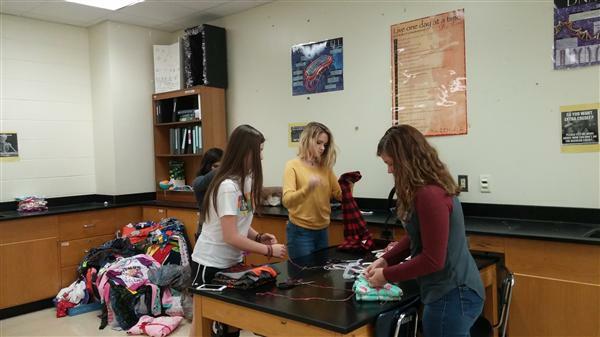 From a field trip to the state fair to Wake Up To Ag Day, FFA and its members have participated in many activities and events at PR and in the community. 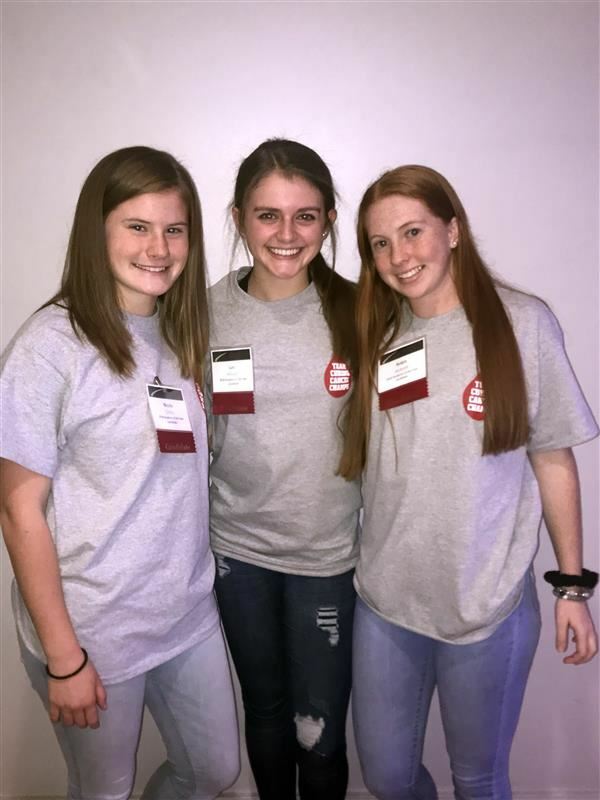 Three girls with the help of one teacher at Porter Ridge High School took on a challenge to raise $50,000 for the Leukemia & Lymphoma Society. Sophomores Luci Hinson, Nicole Cristy and junior Robin Jackson with the help of Math teacher Susan Driver competed to be 2018 Students of the Year for the Leukemia and Lymphoma Society. StuCo: leading the way and having fun doing it! Everybody enjoys the fun and unique events that PRHS has to offer, but has anyone ever stopped and wondered, how are these events done? Who is in charge? Whose plans and ideas are these? How are these things put together? The PRHS Student Council, also known as StuCo, has a team of hardworking students who do their best to make school events full of fun and unforgettable activities, events and memories. At the 2018 Carolina Winter Ensemble Association (CWEA) Mt. 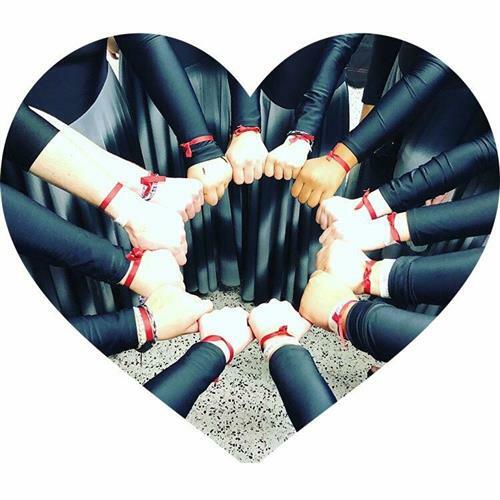 Pleasant Color Guard Competition at Mount Pleasant High School on Saturday, February 24th the PR Band of Pirates Winter Guard honored the memory of a student that they felt was one of their own. Gina Montalto, a freshman member of the Marjory Stoneman Douglas High School’s state-champion marching band winter guard, was a victim of the school shooting that occurred on Feb. 14, 2018 in Parkland, Florida. When most students think about the library, they think of books, but it’s much more than that. The Media Center offers many activities and events that not only encourage reading but also challenge students to use their thinking skills! Announcing new club: Graphic Design Club! This year at Porter Ridge a new club has been created! 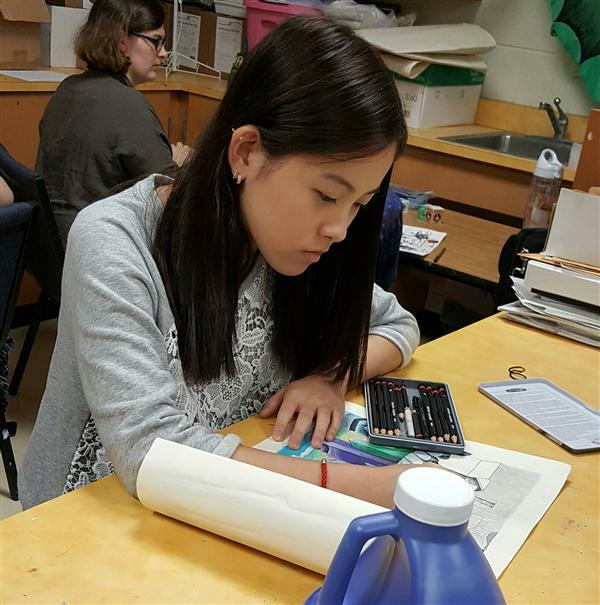 Known as the Graphic Design Club, the members of the club create various pieces of artwork for activities around the school. The club meets after school in room E105C the first and last Wednesdays of every month. Another successful marching band season! It was a successful marching season for the Porter Ridge High Band of Pirates, who performed an exciting show called Date Night in the 50’s. Their season was marked by a crowd-pleasing show, a rewarding opportunity to host Pirate Cove Classic, and the achievement of grand champion at their last two competitions. Porter Ridge High School students and staff have been impacted by Puerto Rico’s devastation from Hurricane Maria that hit the island on Sept. 20th. Students and staff decided to find a way to help. One teacher who is from Puerto Rico and has family living there, Spanish teacher Maria Koonce, organized a drive for much needed items. College Application Week is here! An important upcoming event for students is College Application Week. During the week of November 13th-17th 37 North Carolina colleges will allow students to apply for free! All NC community colleges, several NC colleges and universities, and some private colleges will waive application fees. Get the full list of colleges from CFNC’s website by clicking here. 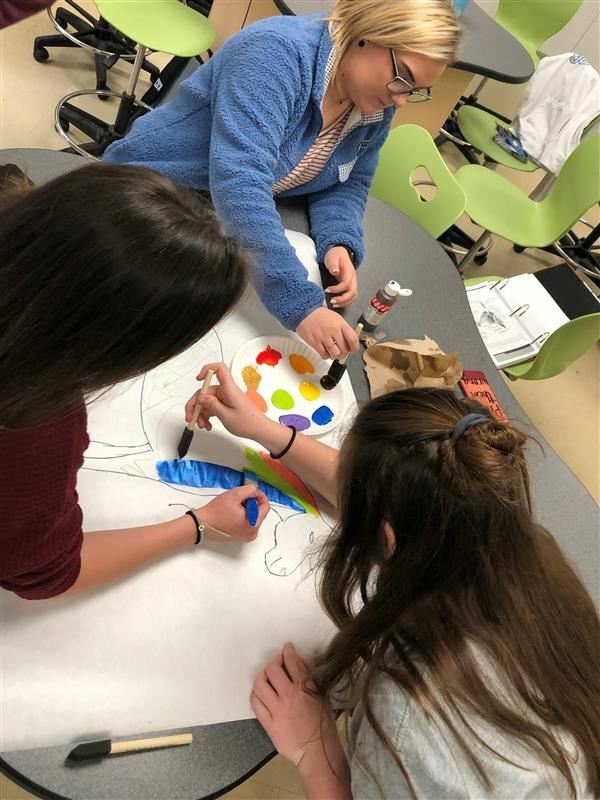 In celebration of National French Week 2017 (La Semaine du Français 2017), which ran from Nov. 1st through Nov. 7th, Mr. Crider’s French classes participated in several activities. 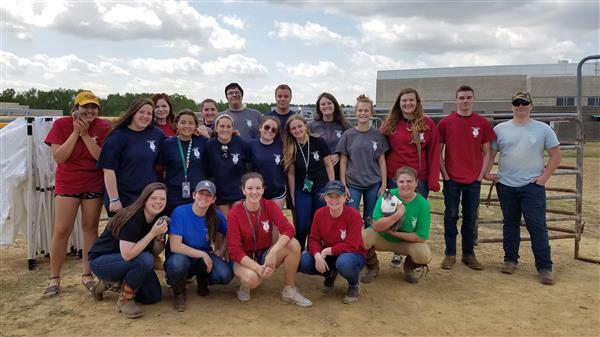 During summer break Ag teacher Bethany Sweatt and students from her second semester vet assisting class helped with a summer vet camp for rising 7th and 8th graders. 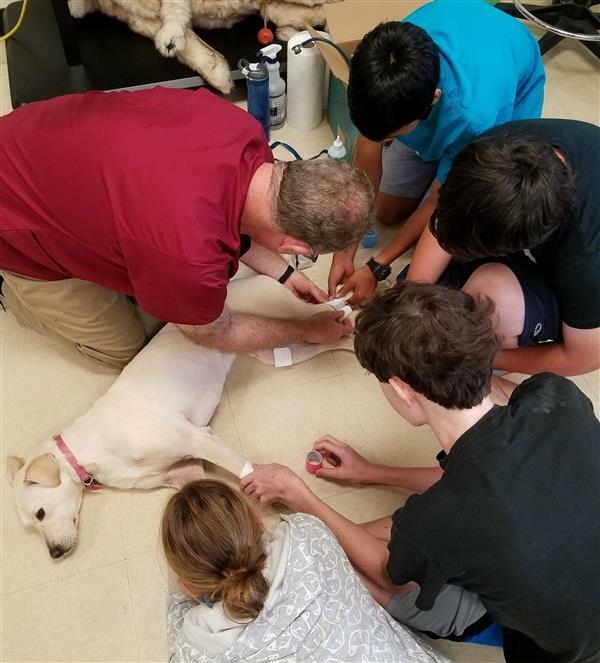 The camp took place at PRHS July 31st through August 3rd from 9 a.m. to 3 p.m. Campers learned pet CPR, correct procedures for handling animals, information about pet diseases, and animal first aid. 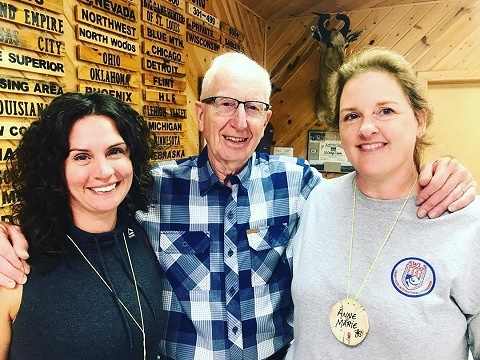 On June 2nd, senior Emilee Strohl set off on a journey like no other when she lived for a month in Germany. 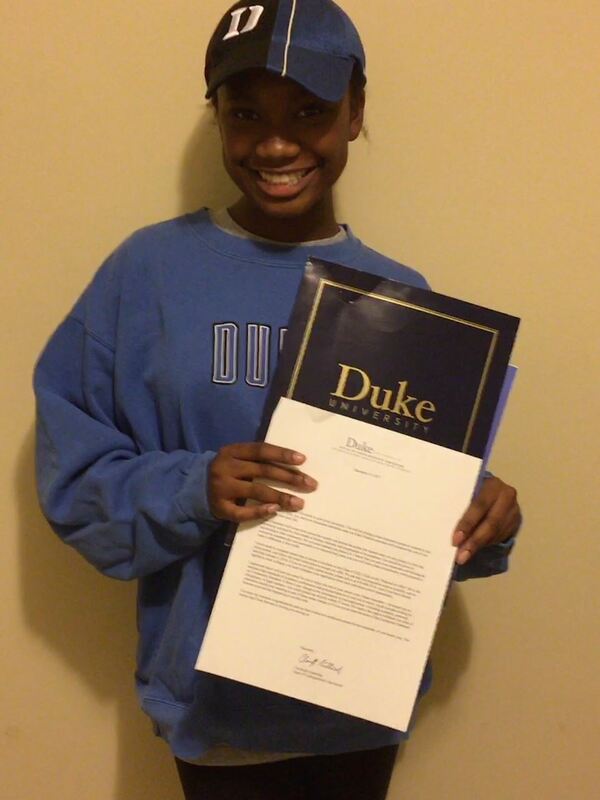 She stayed with Liese Hartmann, a former foreign-exchange student who attended PR in the previous year. 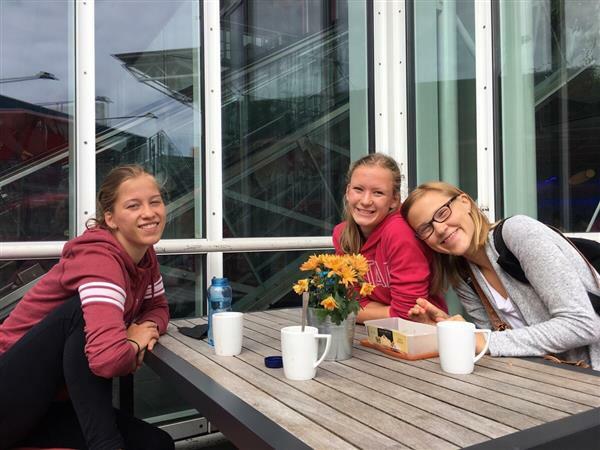 “I took my trip because Liese quickly became a sister to me,” she explained, as the two were on the Field Hockey team together when Hartmann attended PR. In June 2017, students from PRHS accompanied by English teacher Rachel Lukasik traveled to Belize in Central America. Once there, they participated in a variety of activities, including: making chocolate from cacao beans, snuba diving, ziplining, learning about local wildlife and culture, exploring Mayan ruins, learning jungle survival skills, exploring caves, and hikes through the jungle. Each year the UCPS School Nutrition Department sends out a team of the year application to be filled out by everyone in the school district. All applications are read over by a committee selected by School Nutrition. Once the applications are reviewed, the school that best meets the team of the year qualifications is chosen based on satisfaction of customers, in terms of service, consistency, cleanliness, quality of food, and overall great team work. 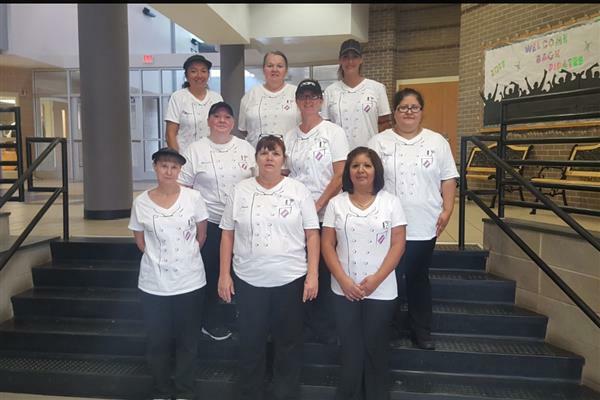 PR's cafeteria staff was awarded Team of the Year for the school year 2016-2017! The class of 2021 attended Freshman Orientation on Wednesday, August 23rd to welcome them into their next four years at Porter Ridge High. 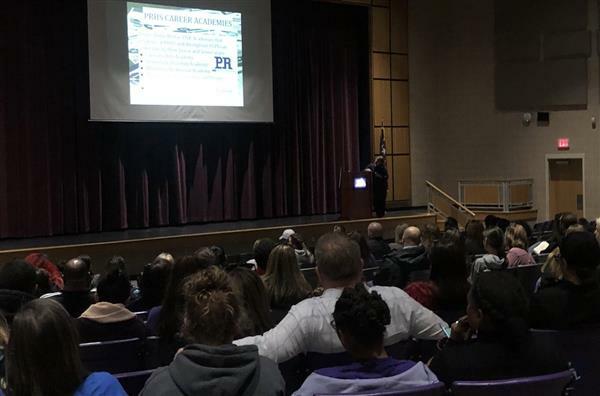 During the orientation program, Principal Bashawn Harris wanted to properly introduce freshmen to the rich culture of Porter Ridge High School, go over the standard “Big 3, Little 3” rules and . The freshmen also toured the school to meet their teachers. Lastly, the freshman attending all signed a promise to graduate Porter Ridge. 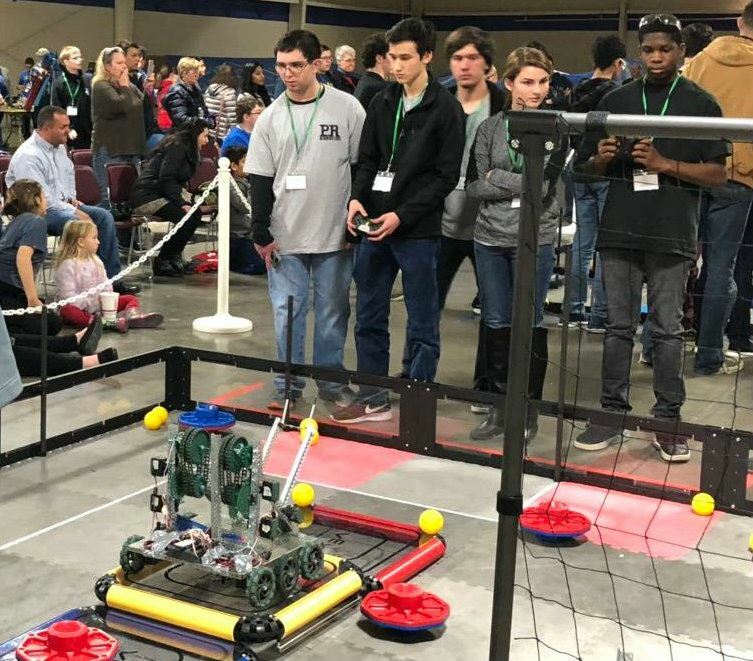 The Porter Ridge High School Robotics Club teams competed in the Spring Robotics Challenge at the SPCC Tyson Family Center on Saturday, April 22. This year’s Vex IQ Robotics competition for high school robotics was a points game of skill and longevity. The goal was to knock large foam jacks from a barrier down the middle of the field. Points were awarded based on where they landed or if they were pushed to the other side. Points were also awarded based on a robot's ability to lift itself against the frame of the field. 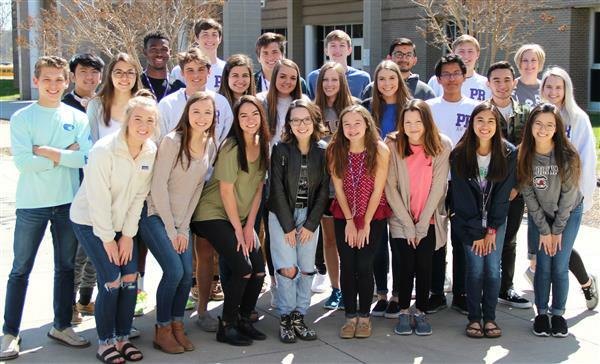 After two years of planning and preparation, on April 7th the Porter Ridge Pirates Abroad Club departed for their eleven day journey to Europe. 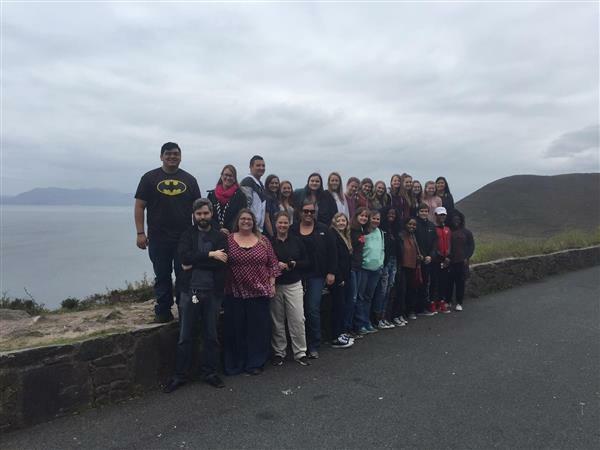 Twenty-one students and six adults departed Charlotte to visit and learn the culture of four different countries led by English teachers Amanda McDevitt and Aaron Boyles, and PR's school nurse, Charlee Williams. 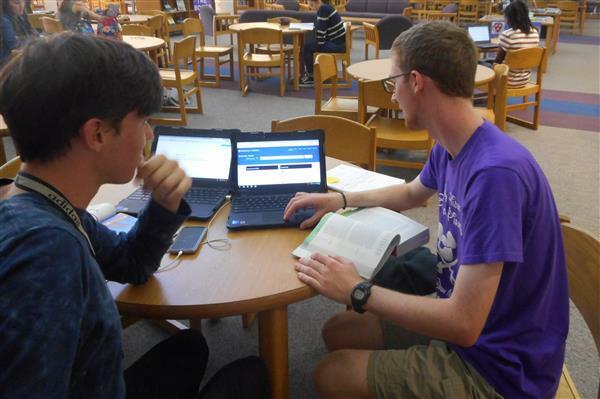 Two students here at Porter Ridge High School will be graduating in June with a high school diploma and an associate's degree from South Piedmont Community College for the first time in PRHS history. 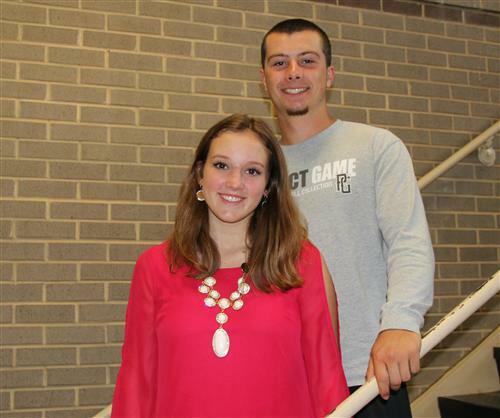 Kayla Prince and Tristan Shea are two seniors who have worked year round to earn both. Porter Ridge High School students came out in droves to show their support for protecting the Earth during the school’s second annual Earth Day Fair. The event, coordinated by Regina Snelson, the school’s media coordinator, showcases the hard work of Jill Keller’s Earth/Environmental Science classes. Porter Ridge has added a new class this year that enriches students' daily lives. Offered in the Career and Technical Education (CTE) department, Apparel & Textile Production I is taught by Lisa Goldberg. This course is a hands on class that teaches basic sewing skills and skills that apply to real life. 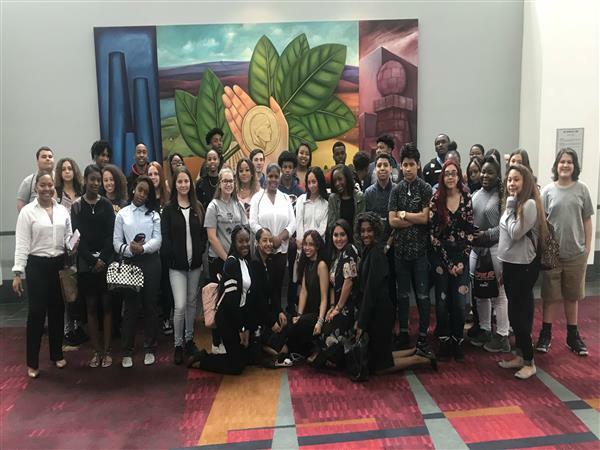 Future Business Leaders of America (FBLA) club members and fellow Career and Technical Education (CTE) class members visited Johnson & Wales University and CPCC in uptown Charlotte on Tuesday, March 21st. 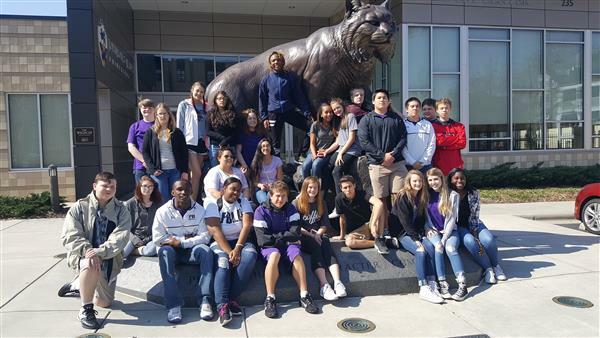 A group of Porter Ridge High School students in a Pharmacy Tech Class, part of the Career and Technical Education’s Health Science Program, are a prime example of UCPS graduates being better prepared for college and careers. 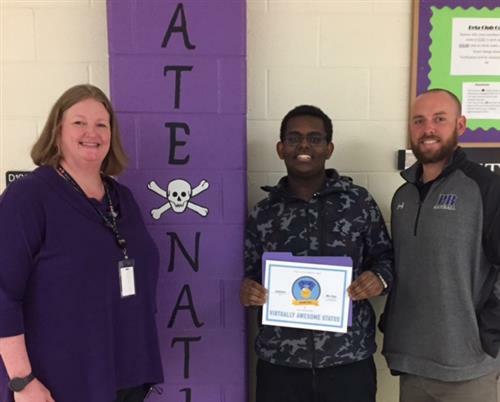 UCVirtual is excited to honor Porter Ridge senior, Joseph Ezaz, for being our "Student of the Six Weeks!" Ezaz is pictured with his online Math III teacher, Dr. Wade, and his lab facilitator, Shayne Milligan. Pirate Palooza, the most exciting week of the school year, started on Monday, February 20th. Activities included: Gatorball, Team Trivia Throwdown, Dress Up Days, and the first ever Color Run at Porter Ridge High School. This winter break, Social Studies teacher Kat Smith will have the opportunity to travel to Israel. During her nine day visit, which begins on December 22nd, she will be visiting different schools in the area, as well as experiencing life with a host family. Porter Ridge High School's CTE Program will offer a Pharmacy Technician course second semester this year. Health Science Teacher Edwina Baucom will teach the world of Pharmacy Technology second semester. It will be a journey into one of today’s fastest-growing fields in health care. 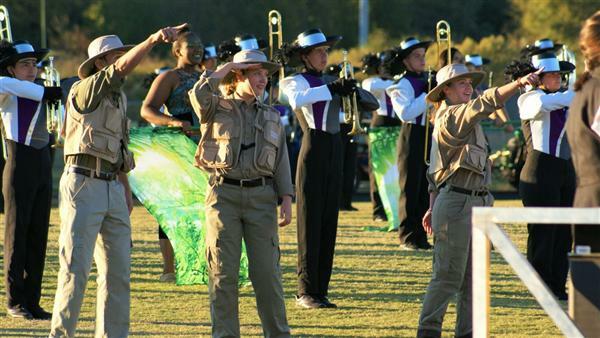 The Porter Ridge High School Band of Pirates took a trip into the jungle this year with their 2016 Field Show, "Africa: A Jungle Safari." The band has been working hard since the beginning of August this year, welcoming about 50 freshmen to the program. 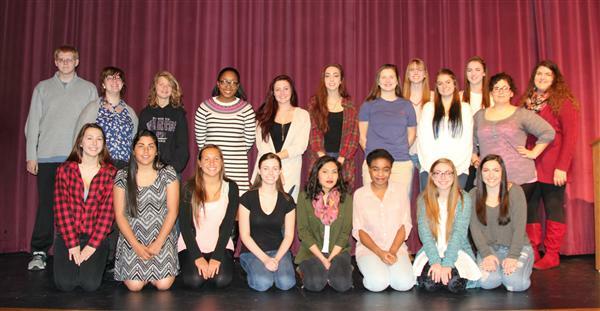 National Art Honor Society, commonly known as NAHS, is a group of students who come together to focus on art and art related events. Jan Kerley and Nicole Crowley are sponsors of the club. Kerley says, "I love sponsoring NAHS because it gives me the opportunity to get to know students better. I love doing community service with them and having fun events like Edible Art Night. The bonds formed with these students will last for a lifetime." The Boston Massacre was one of the pinnacle points for propaganda in the American Revolution and to learn of its importance is a must in any American History class. 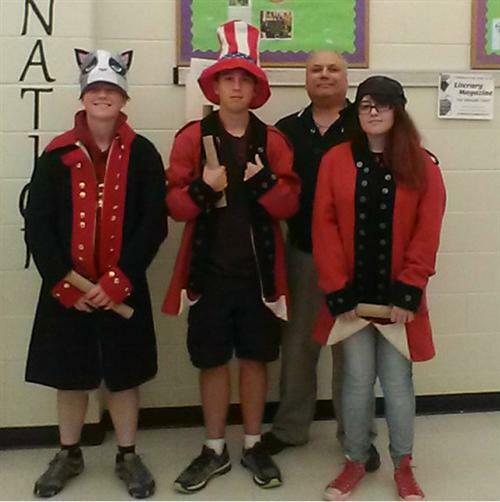 US History teacher Dan Korn provided his classes with both an interactive lesson and reenactment in order to learn about propaganda, as well as the true story of the massacre. Voyagers, PR's multicultural club, raised $1,300 for the American Forests Foundation during the month of September. 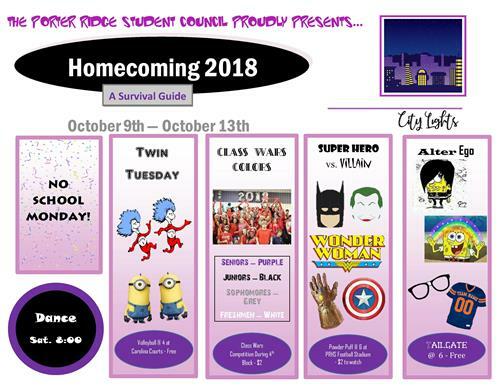 Each year Porter Ridge High School celebrates Homecoming with a spirit week complete with dress up days, Quidditch, and a dance. This year Homecoming Week was October 3rd through 7th. Pirate Nation’s fall sports are officially in full stride. 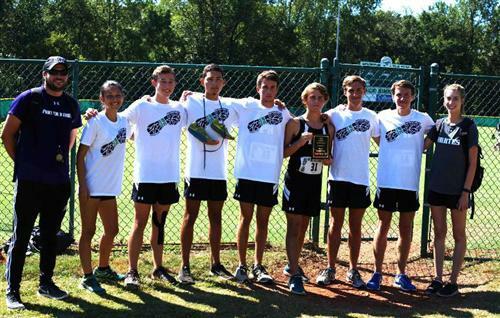 On Saturday, September 24th, the Porter Ridge Cross Country team participated in the Myer’s Park Invitational along with several other teams from both Mecklenburg and Union County. In honor of National Art Awareness Week the Fine Arts Dept. would like to thank the Administration and Faculty of Porter Ridge High School for their unwavering support of the Fine Arts Programs here. In the Fine Arts curriculum the students become family and support each other and their teachers. "Learning in a Visual Age, it becomes imperative that students have the art background to be well rounded people. It is a proven fact that the new CEO’s and directors hired by companies are creative people who can think outside of the box and therefore are better problem solvers. They have imagination, perception, recognition and sensitivity. All personality traits and talents which take them further in being great managers of people. At PRHS we strive to broaden the Fine Arts students’ view of the world globally and creatively," commented Jan Kerley. 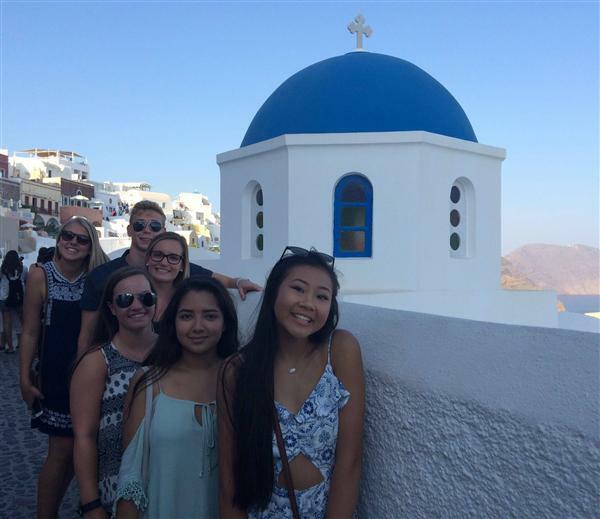 Six Porter Ridge students accompanied Math Teacher Jennie Yearick on a travel tour of Greece in June of 2016. They spent three days in Athens learning about the Greek culture and experiencing the beautiful countryside as well as unique sites such as an olympic stadium, The Acropolis and Parthenon, the Temple of the Oracle of Delphi. There was plenty of local shopping for souveniers, a "Greek Evening" with traditional food and dance, and a fun cooking class to boot! Four years. Eight semesters. Thirty-two classes. Graduation is a day every high school student can’t wait to reach, but it's what has been done and accomplished along the way to graduation that really counts. For Porter Ridge High School Senior Joanny Rodriguez, "It's been full of ups and downs and many obstacles, but it's all been so worthwhile." 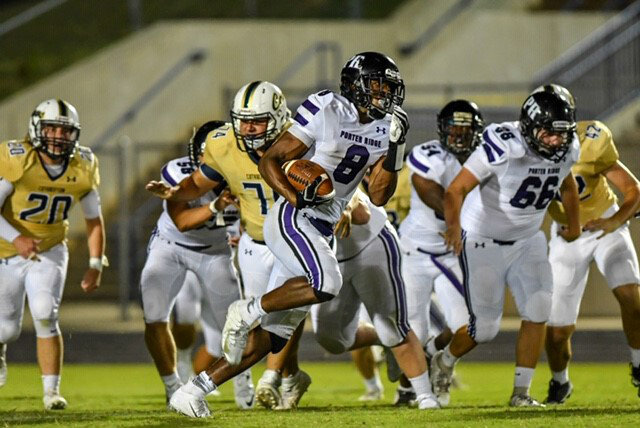 Porter Ridge prides itself on many different things: sports, fine arts, academics and so much more. 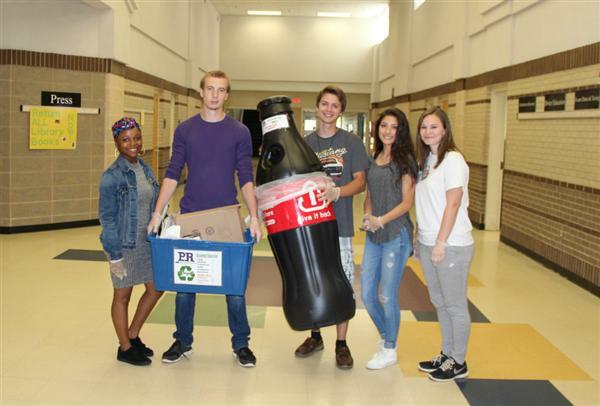 One thing that has grown in the last two years is the amount of recycling that Porter Ridge does. 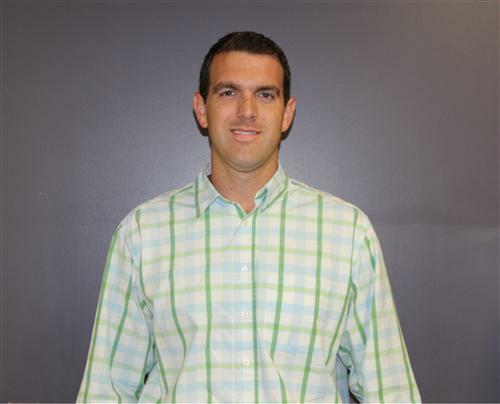 Greg Wenger has been named the new Head Varsity Men’s Basketball coach at Porter Ridge High School. Two PRHS juniors, Kayla Prince and Tristan Shea, have been chosen to serve as youth mentors for the Sandbox program. 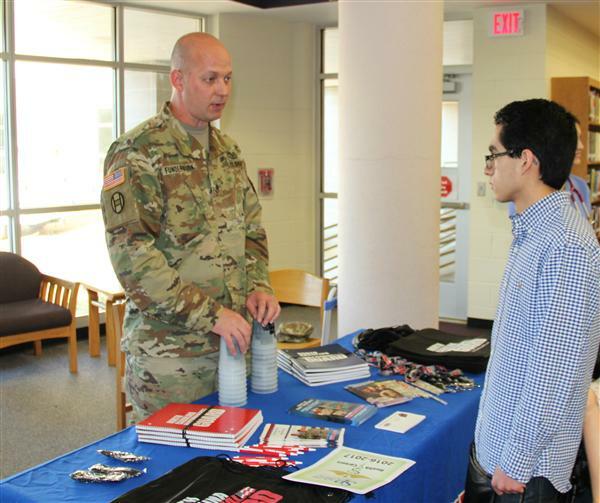 On April 26, Porter Ridge High School hosted its first ever Career and College Fair in the Media Center. Representatives from various colleges and industries set up informational tables designed to pique the interest of the PRHS students who rotated through the fair. Air Force Junior ROTC students from Piedmont and Porter Ridge High Schools in Union County recently visited New York State where they toured the West Point Military Academy and New York City. Students were tasked with homework assignments that they would brief at each stop on the jam-packed four day tour. Several of the 50 students in attendance had the opportunity to present their topics on the bus ride to and from New York. "Sometimes it is just too noisy for the students to be heard trying to brief a large group on a busy Manhattan street," said Captain Louis Werder, the Senior AFJROTC Instructor at Piedmont High School. The student briefings on the World Trade Center, Freedom Tower and the 911 Memorial were accompanied by a 911 documentary. 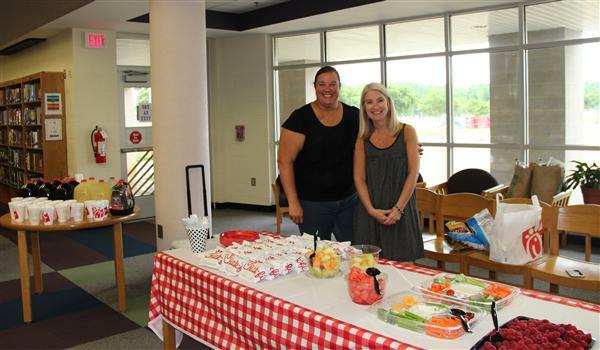 The Parent Teacher Organization at Porter Ridge plays an important role in the school community. They do everything from providing needed money for classroom supplies to organizing teacher appreciation events. It is a great way for parents to get involved and help out the school. 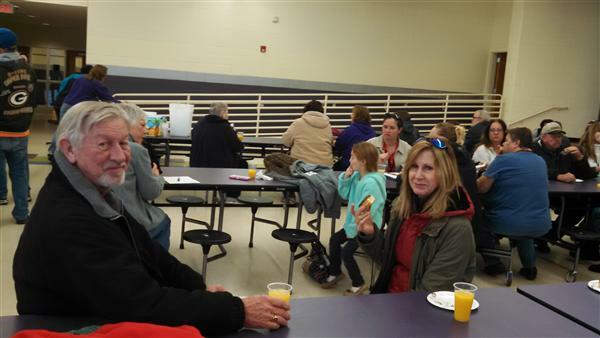 Meetings are generally held twice a year and the PTO Board meets each month. 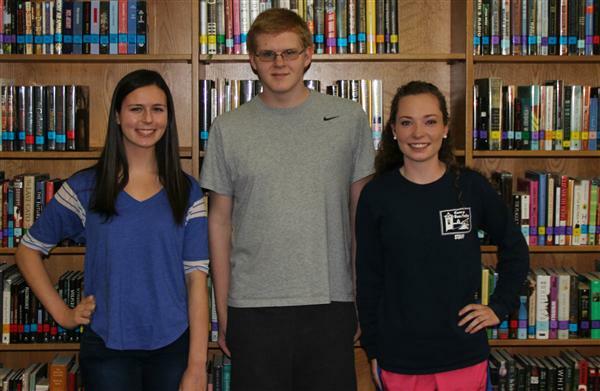 Three Porter Ridge High School seniors were awarded the Union County Education Foundation’s "Sweet Salute" college scholarships. 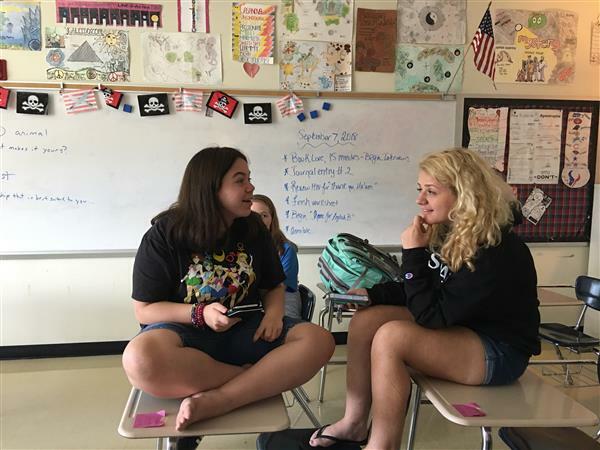 To apply, Ellie Thompson, Amanda Conti and Jacob Hayward had to each write an essay about their most significant teacher. Moreover, they were to chose a favorite teacher who they feel most impacted them not only in their education but also their growth as a young adult. Saturday, April 16th, the Robotics Club participated in their third competition, the Second Annual Union County Robotics Challenge. Porter Ridge had three teams compete: the Bilge Rats, Piratech, and Queen Kait’s Revenge. This year’s competition, "Nothing But Net," featured a basketball style match-up of robots. Teams competed by shooting or dumping foam balls into baskets. Porter Ridge High School senior Corine Olarte was named the April recipient of the John H. Crowder Service Award. Olarte has been active in Student Council at PR and has served as a group leader in multiple projects and as an officer and the team event coordinator in an event called "Spark Plug." In March of 2016, Social Studies teacher Daniel F. Korn was invited to attend a Bill of Rights Institute Symposium at Mt. Vernon sponsored by the Liberty Fund. 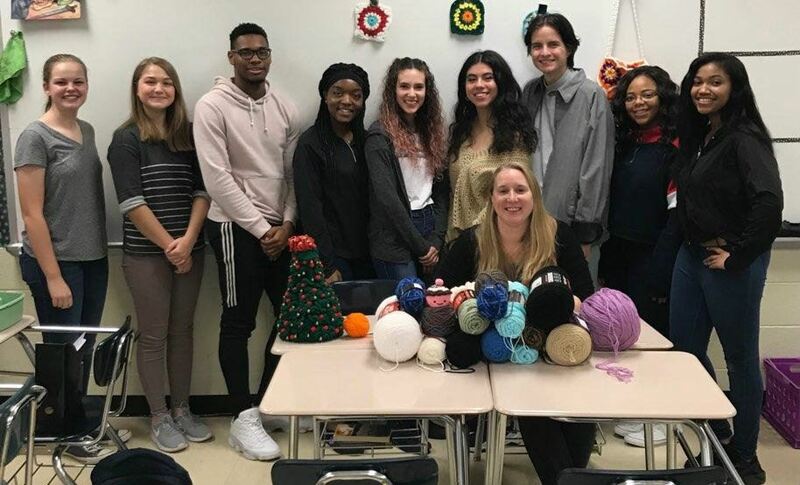 While there were nearly 500 applicants, Korn was the only teacher selected from North Carolina, along with seventeen other teachers from across the country. 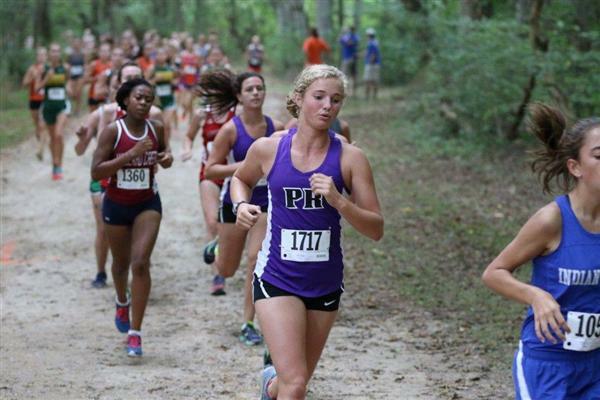 Getting a call on her cell phone from a Washington, DC, area code sent Porter Ridge High School senior Alyssa Stoltz’ heart racing. She had been waiting for weeks to find out if she would receive the coveted appointment to the United States Merchant Marine Academy at Kings Point in New York. This spring Porter Ridge’s Play Production class is presenting the three-act play Lord of the Flies. The show will be presented to the community March 10th, 11th at 6:30 pm and March 12th at 2:00 pm. The Play Production class is doing something different in the theatre program this year. In the past the theatre department produced numerous musicals. 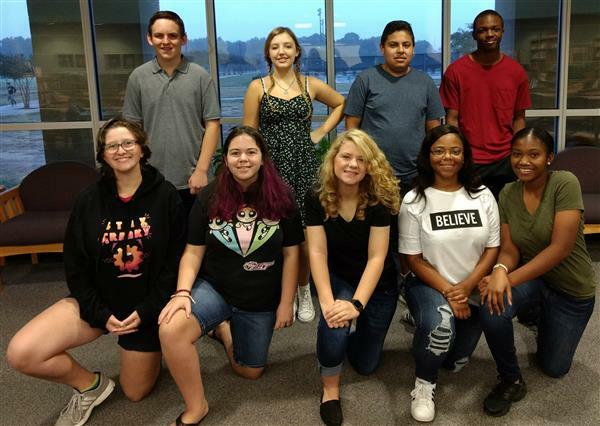 This year Theatre teacher Jessica Briggs wanted to step out of her comfort zone and give her students an opportunity to reach out to the community through plays that send a message. She also wanted to give them the ability to grow stronger as actors. All of the students in the class have been a part of the program for almost four years. Presenting Lord of the Flies is the last chance for a majority of the senior boys in the class to be invested in a project. The students were inspired by CATA’s production last year. Student director Corine Olarte has big plans for this show. “The show is filled with so many intense moments, They are not only dramatic, but core-shaking” says Orlate. 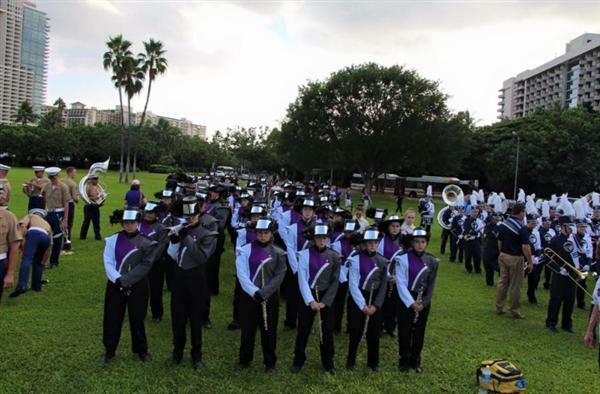 The Porter Ridge High School Marching Band marched in the Pearl Harbor Memorial Parade on December 7, 2015, in Hawaii. Only five other bands from around the country were given this opportunity. The Band of Pirates performed with all the invited bands and the Marine Corps Band in the parade’s opening ceremony. Porter Ridge’s drum majors Dylan Chavis, Grace Zelen, and Savannah Meier honored Purple Heart recipients with Hawaiian leis at the opening ceremony prior to the parade. PR offers many after school activities for students and one program students can attend this year is the Media Center's Maker Series workshops. 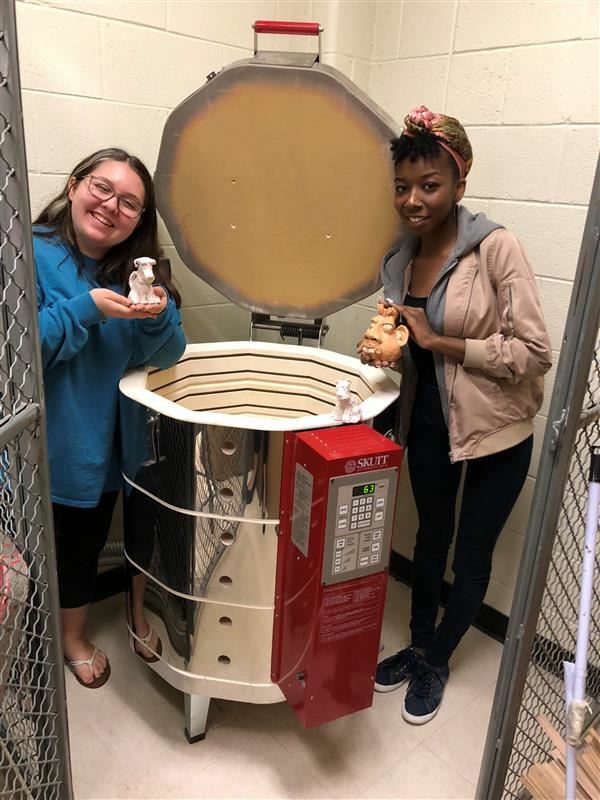 The "Make It Here" series is held about once a month and allows students to create, make and take a project at each workshop. According to the American School Bus Council, Love the Bus is ASBC’s "ongoing campaign to raise awareness and appreciation for the hundreds of thousands of school bus drivers who safely transport children to and from school. School bus drivers have made the Yellow School Bus the largest and safest transportation system in the country and are deserving of our thanks. By understanding the value of student transportation to our education system, Love the Bus promotes the idea that every person involved in our schools is critical to our children’s success." 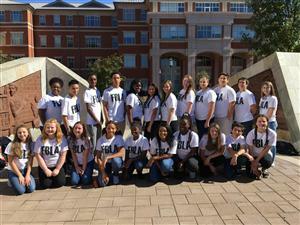 On Friday, October 30th, PRHS’ FBLA Club visited UNC-Charlotte. 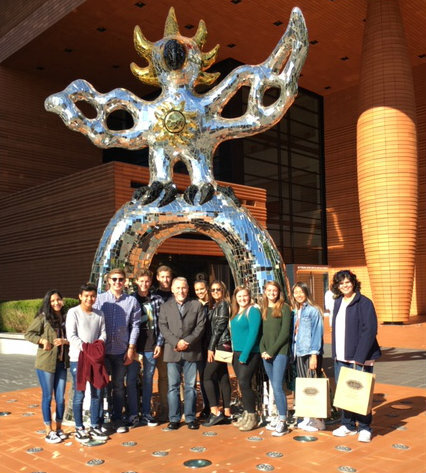 While on this trip members had an opportunity to speak with an Academic Counselor and learned about the history of the university and admission requirements. Porter Ridge High School is proud to announce Michael Hertz as the next Head Football coach of Porter Ridge High School. Hertz comes to Porter Ridge with extensive academic and coaching credentials including 19 years of experience and licensure in English, Physical Education and Social Studies. 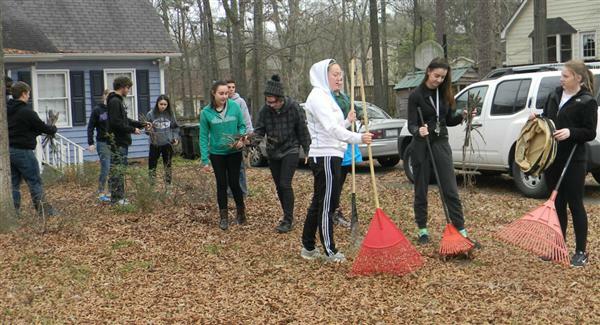 On Monday December 21, student members of the Porter Ridge Rho Kappa Social Studies Honor Society donated their time in a community service project to help out a retired long time UCPS teacher. From decorating, to making cookies, to listening to holiday music, the holidays, for many, are filled with traditions. Many children, on Christmas Eve, will sleep in a new pair of pajamas. Unfortunately, not all in our community have the means to buy even just a new pair of pajamas. King’s Pajamas is working to change that. This past November 13th, Porter Ridge held its annual Poetry Slam. The Poetry Slam is an event where students who have a love and talent for writing poetry get the opportunity to express themselves to their peers and administration. This year, 20 finalists made their way to the stage where they discussed stereotypes, positive body image, and the current generation's identity. Porter Ridge High School’s Choral Program is branching out and getting involved in some new things this year. From singing at community events to the start of a new extracurricular acapella group, music is in the air at PR. 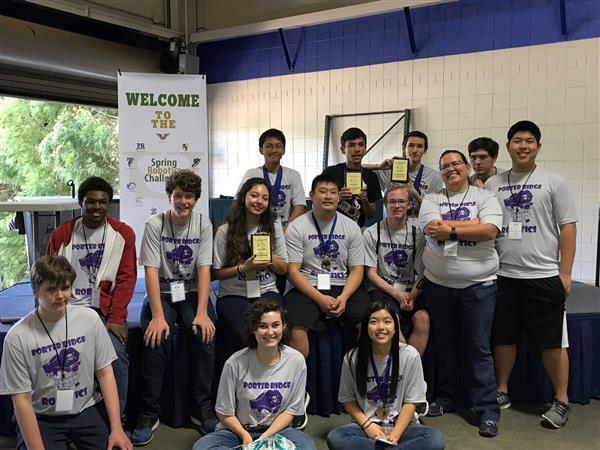 Porter Ridge Robotics Club had two teams compete at the Inaugural Fall Robotics Classic, held at CATA this year on November 21: Piratech and Pi-Bots. This year’s competition, “Nothing But Net” featured a basketball style match-up of robots. Teams were paired up and competed, by shooting or dumping foam balls into baskets. During the first six weeks of school, Acacia Sammons’ classes explored the concept of identity, through reading excerpts from American Sniper by Chris Kyle and American Wife by his wife, Taya Kyle to examine what it means to have identity, have it altered or shaped by war, and how someone's identity can alter their loved one's character. For the first time in school history, Porter Ridge High School served as host to the John Lennon Educational Tour Bus. The John Lennon Educational Tour Bus was founded in 1998 as a non-profit state-of-the-art mobile audio and HD video recording and production facility. With the very newest technology and gear, the Bus continues to be dedicated to providing young people with tours of the studios and participation in free songwriting and multimedia production workshops. With the assistance of three on-board engineers, Fine Arts students learned how to write, perform, record, and produce original songs, produce and shoot music videos and documentaries and complete a broadcast quality music video all in one day. 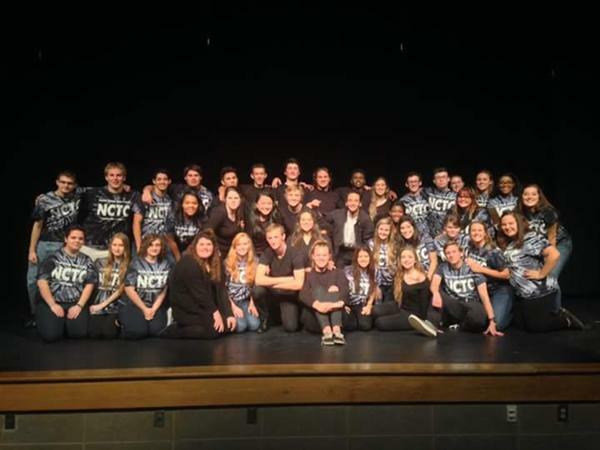 On November 6 & 7, Theatre teacher Jessica Briggs and the Porter Ridge High School Honors Theatre Class hosted the North Carolina Theatre Conference (NCTC). The conference is an event statewide and Porter Ridge was one of eight host sites. A total of 16 plays were performed from 12 different schools from across the state. From October 28th-30th, students all over Porter Ridge could be seen carrying pink carnations throughout the day, showing their support for breast cancer research. Beta Club just finished their first service project for the year to raise money for the Breast Cancer Research Foundation. 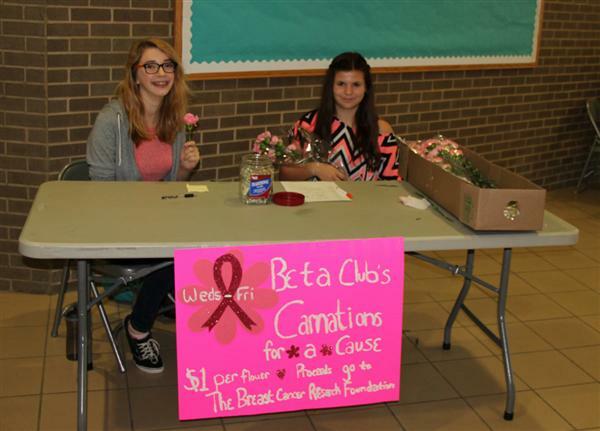 In return for a $1 donation to the foundation during lunch, a pink carnation was given. 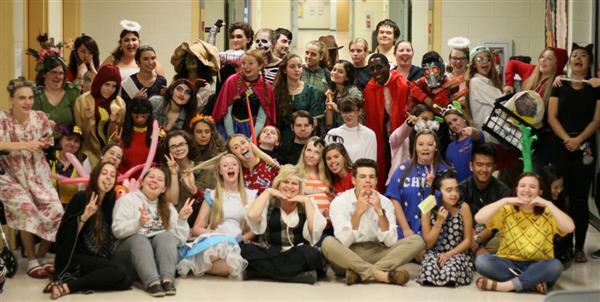 In celebration of National French Week 2015 (La Semaine du Français 2015), which ran from Nov. 4th through Nov. 10th, Mr. Crider’s French classes participated in a number of events. English teacher Amanda McDevitt was named Porter Ridge’s 2015-2016 Teacher of the Year. McDevitt was chosen by her peers and then was interviewed by a panel before being chosen Teacher of the Year. Cross Country runner, sophomore Sloan Ducey, was named All-Conference at the Southwestern 4A Conference Meet at Myers Park High School Wednesday, October 21,2015. 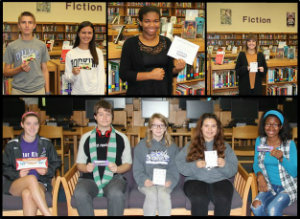 Each year, the Media Center at Porter Ridge High School holds book contests for students to enter and have the opportunity to win prizes. These contests encourage students to read and promote reading. 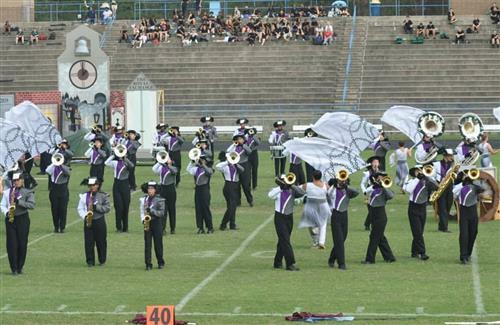 It was an eventful weekend for Porter Ridge High School’s band program. 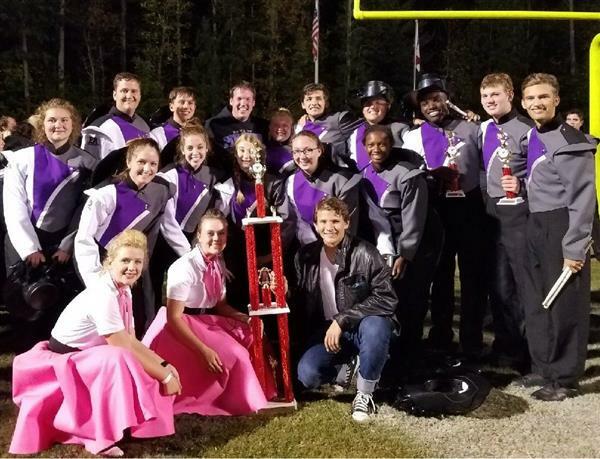 The Band of Pirates was named Grand Champion at their first competition of the season on Saturday, Sept. 26th at the Sandhills Classic at McBee High School in McBee, South Carolina. A total of 15 bands performed at the event. Every year PR welcomes new students and new teachers. 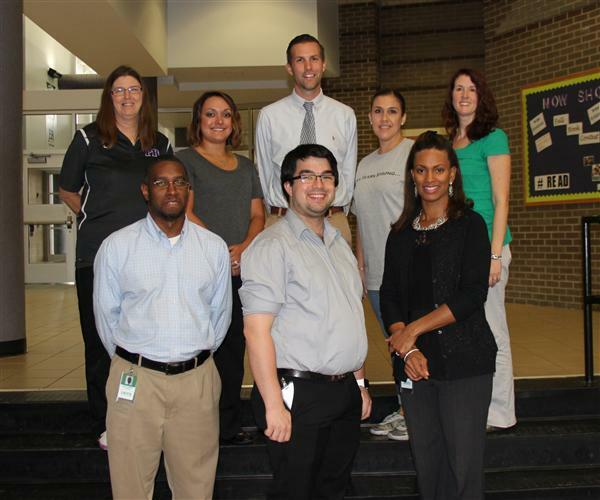 This year eleven new teachers joined the crew, each with their own educational philosophy. Porter Ridge is excited to introduce a new class this year: Introduction to Automotive Service. This new class provides students with a foundation for continuing into the Automotive Academy that can lead to becoming a certified mechanic.